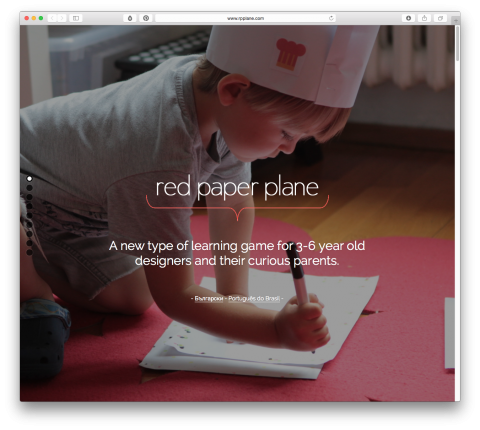 The folks behind Red Paper Plane believe that “Missions” are a whole new way to learn and play for little ones. They created mission based design challenges for the whole family, based on a creative process – 20 minutes per day for several days. This is fantastic! Especially for snowy winter weekends! I’ll totally try the Spaceship Mission with Tilo (5) this weekend. This is a lovely idea and beautifully designed, but not a “whole new way to learn and play”. These kinds of focused family activities, and the idea of going on, or having, an organized “mission”, have been described and used by many groups. The creation of their own props, learning materials, and decorations is something most kids do naturally, and most parents encourage and participate in. My children, now in their thirties and forties, went to a private school that sent home “family project ideas” with worksheets, materials lists and learning objectives, every quarter. Longer “missions” or as they are sometimes called “field trips” can be taken by families as well as school groups, and provide wonderful opportunities for togetherness as well as learning and experimentation. With all that said, it is true that the Red Paper Plane people put together some very stylish and charming packages, and they are generous and kind to offer them for free! Dear Michele, thank you for your nice words and the constructive feedback. I’m Tsvetelina Kamova, the creator of Red Paper Plane. As you can see, the missions are in fact project-based activities – which, of course, is nothing new in itself. Many parents design and do projects together with their kids, school environments (Montessori and many others) have integrated projects as part of their daily curriculum. What we consider new in our approach is (1) the fact that we put emphasis on the process of problem-solving itself, not on the end result and we provide a basic 3-step structure to follow, modelled on the design thinking method; and (2) the focus on project-based activities usually falls on older kids and ignores children from 3-6, who are usually treated with one-off activities or arts & crafts projects. That said, it is a new way to learn and play for 3-6 year olds and (especially) their parents, not for children in general.